A special CBI court rejected on Friday Rajesh Talwar's application seeking annexures submitted by the CBI along with its closure report in the Aarushi murder case. It will hold the next hearing on January 25. In a setback to the doctor couple, special judge Preeti Singh rejected Talwar's application. The court observed that there is no provision under the law to give him the case diary or documents as he is not in the category of accused yet. Earlier, heated exchanges between the counsel for CBI and those appearing for parents of murdered teenager Aarushi Talwar took place in a special court here today after the agency protested their plea for copies of documents submitted by it along with the closure report, according to PTI. "These (documents) cannot be supplied. Uttar Pradesh police arrested him and hence technically or legally he is an accused till the court discharges or acquits him," CBI counsel R K Saini said. He quoted a number of Supreme Court judgements besides those of the Allahabad High Court to buttress his argument. Saini said nothing beyond the closure report, which has already been given to Rajesh Talwar, should be provided. He also said that the FIR was filed by Talwar against his servant Hemraj who was found dead. The Talwars had on January 11 filed an application seeking all documents submitted by the CBI in support of the closure report. Talwar's counsel Satish Tamta objected to his client be called an accused. "It is not right to call my client an accused at this stage. The court had observed last time that nobody is an accused at this stage. We are here in the capacity of first informant. To say that they have given wrong information is incorrect. We are not demanding copies of the case diary," he said. "What we want is documents like CFSL reports so that I can help the court. It is such a big double murder, how can the case be closed. I don't want the case closed. I am asking for the documents in the interest of justice." He accused the CBI of an uncooperative attitude. Meanwhile, Fatehchand Sharma, counsel for three servants who were also arrested in the case supported CBI and said Rajesh is an accused like them and hence should not be given any documents. "The court should order further investigation and direct the CBI to file a chargesheet," Sharma said. The court after hearing the matter for nearly half an hour adjourned the matter till after lunch. 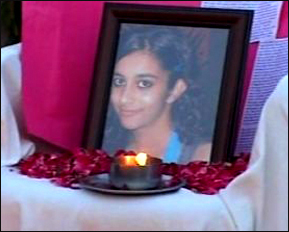 Aarushi was found murdered in her room with her throat slit at her residence on May 16, 2008. The body of Hemraj was found on the terrace the next day. In its closure report, CBI held Rajesh as the prime suspect but said it had insufficient evidence to file a chargesheet against him. The CBI conclusions were trashed by Rajesh and Nupur. The CBI had on December 29 filed a report to end the probe clearing the names of three servants -- Raj Kumar, Krishna and Vijay Mandal -- in the case.